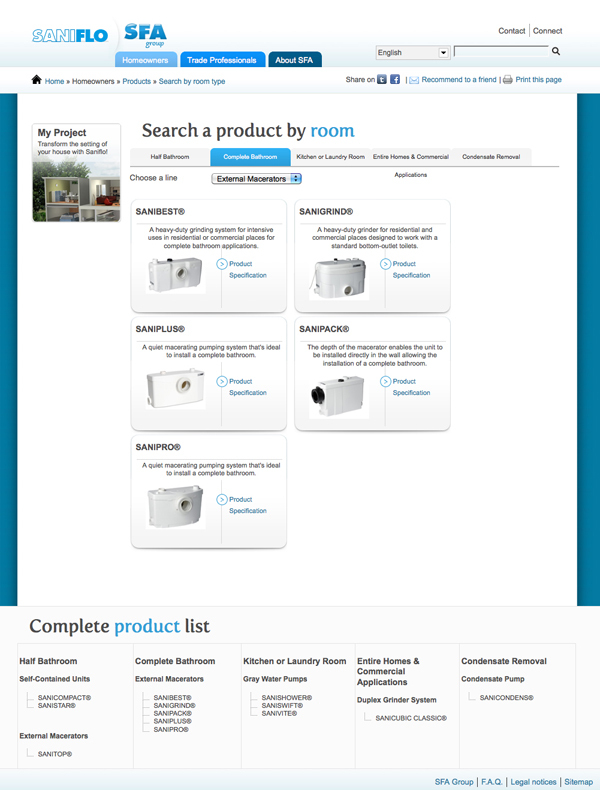 EDISON, NEW JERSEY (MAY 10, 2011)—SFA Saniflo Inc. recently unveiled a newly renovated North American website, designed to make selecting the right macerating or gray water system for a particular residential or commercial application easier than ever. “Our intent is to take web-site visitors by the hand and make their projects happen,” explains SFA Saniflo CEO Regis Saragosti. “The new site will help a home or building owner find the correct products for their applications, while offering a variety of locations to purchase the product and even a list of qualified installers. At the end, there is a recap of this information, available for printing out on a single eight-by-ten sheet of paper. What’s your application? The home page of the new site offers graphic links to five different application types: complete bathroom, half bathroom, kitchen or laundry room, entire homes and commercial applications, and condensate removal. Each option has a special button that links the web-site visitor to the Saniflo products that can potentially handle that application. These product pages, in turn, include detailed descriptions and specification data, photos and illustrations, accessories, and where-to-buy information. 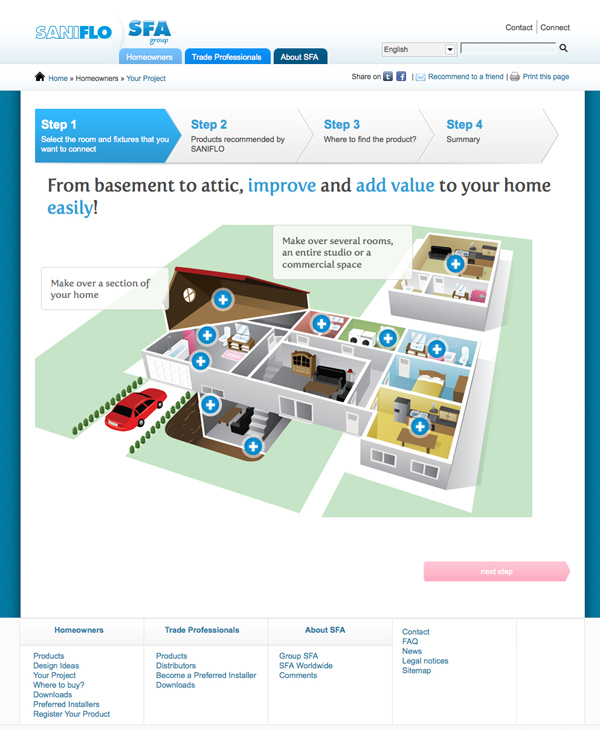 The site also features an illustrated, step-by-step guide to managing and completing a home-renovation project, using a question-and-answer format with different information depending on the room. User-friendly: Consumers and commercial end users can also request a brochure, view lists of distributors and installers, or use a link to Saniflo’s Facebook and Twitter pages. Trade professionals can download product catalogs, installation manuals, certification information, FAQs (frequently asked questions) and even press releases. Contractors can also apply to become Saniflo Preferred Installers. “Saniflo has a wide assortment of products for numerous residential and commercial applications,” comments Saragosti. “We wanted to make it as easy as possible for home and building owners as well as installers to find the right product for a given application. 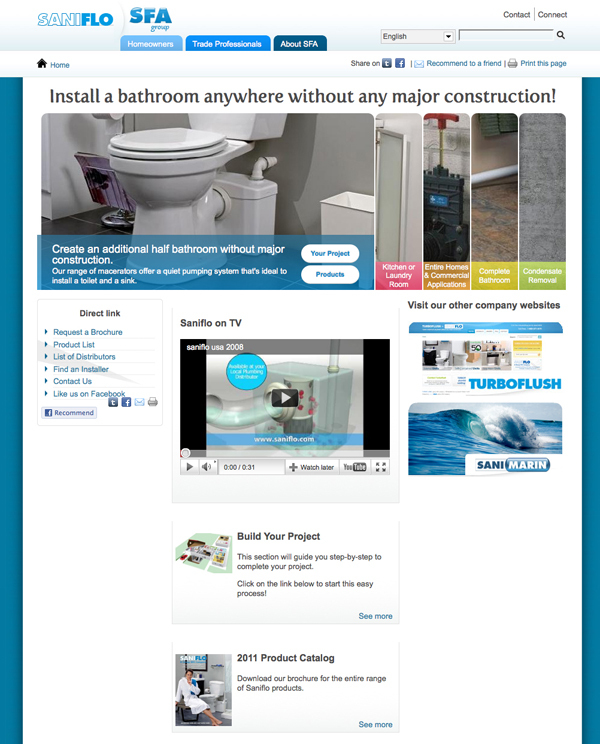 SANIFLO U.S.A.—whose parent company originated macerating plumbing technology—offers a complete line of up flush toilets and gray water pumping systems for residential and commercial applications. Saniflo developed its innovative, “above-floor plumbing” technology more than a half-century ago and has led its commercialization worldwide. Today, the company markets macerating technology through 14 subsidiaries in 50 countries. Saniflo markets through independent sales agents throughout North America, and the product line is currently available at distributor and dealer locations throughout the United States and Canada. To download an image file, click on the desired image and a zip archive automatically downloads to your computer. Due to how various browers handle downloads, you may have to expand the zip archive manually. Illustrated, step-by-step guide to managing and completing a home-renovation project. Each application option has a special button that links the web-site visitor to the products that can handle that application. Product pages include detailed descriptions and specification data, photos and illustrations, accessories, and where-to-buy information.